Garlic can be found growing in the wild between the seasons of Spring and Late Summer, and has a chance to regenerate during those seasons every year. Harvest the plant to obtain garlic seeds as well as an average of 20 oz of garlic if the crop is mature. Garlic requires a minimum temperature of 8℃ to grow, and a minimum temperature of 0℃ to stay alive if it is older than the first stage of growth. Garlic is a Nutrient C crop. Garlic is a hardy crop, meaning that as long as it is still in the first stage of growth, it will survive below-freezing temperatures. Seeds from hardy crops can also be planted during below-freezing temperatures. Garlic can be eaten directly. Consuming Garlic replenishes the vegetable nutrient category. crops Options which affect crop growth. Set to true to enable crops on farmland dying from old age. Set this to false to disable seeds being placed on the ground when a crop on farmland dies from natural causes such as freezing temperatures, old age, or not enough sunlight. Scythes can be used to harvest Garlic. 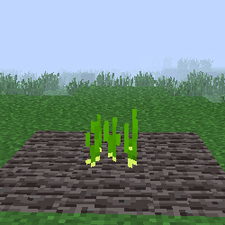 Garlic can be found growing wildly in patches in newly generated chunks. Garlic no longer dies from old age by default. Wild Garlic respawns every year between the seasons of Spring and Late Summer. 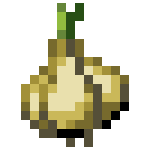 Garlic seeds can only be obtained through harvesting crops. Garlic doesn't instantly die in cold temperatures, and instead has an increased chance to die each day. Dead garlic will leave its seeds on the ground as an non-despawning item similar to the rocks and sticks debris. Wild garlic does not drop seeds when dying from environmental causes. Wild garlic will always die of old age, regardless of the config setting. Garlic seeds can be planted regardless of current temperature. 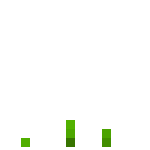 This page was last modified on 25 January 2016, at 00:45.